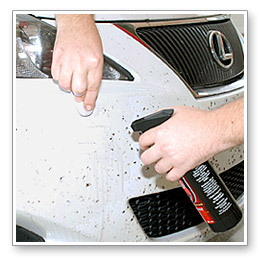 Remove bugs and tar quickly with our paint-safe bug and tar removers, bug sponges, and detailing clay bars. In this detailing guide to insect removal, we’ll tell you how to remove bugs, tar, and tree sap from your vehicle without scratching. We’ll even give you some tips on preventing bug stains and etching. Learn how to keep your vehicle bug-free! What’s So Bad About Bugs? Love bugs are a major problem in the Southeast. Dozens can coat a bumper in just a couple days. 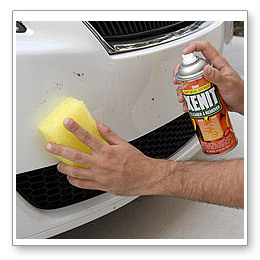 If the spot is relatively fresh, you can use a microfiber towel and a quick detailer to wipe the paint clean. This is ideal because you’re not removing any existing wax. If step 1 didn’t work, you need a stronger solution. McKee's 37 Road Kill Bug Remover is a step up from a quick detailer in terms of cleaning ability, but it is still very gentle on paintwork and glass. McKee's 37 Road Kill Bug Remover softens bug remains to break their bond with the surface. It DOES NOT dissolve bugs, which is a more aggressive approach. If the bug is relatively fresh or you just don't want to use a bug-dissolving cleaner, McKee's 37 Road Kill Bug Remover is a good choice. For really stubborn isolated spots, you can use any number of bug and tar removers that are basically strong cleaners intended to dissolve bugs and tar. Examples are Stoner XENIT and Tarminator, Poorboy’s World Bug Squash, and Wurth Tar Remover. P21S Total Car Wash and Meguiars All Purpose Cleaner Plus are all-over exterior cleaners that work wonders on sticky grime. 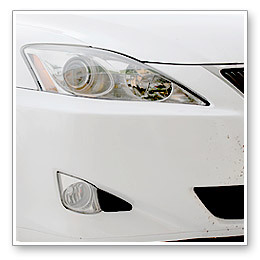 The drawback to bug and tar removers and cleaners is that you will have to reapply paint protection. However, spray waxes and sealants have made it very quick and easy to spot-wax your car. With most, you just spray, spread, and wipe. 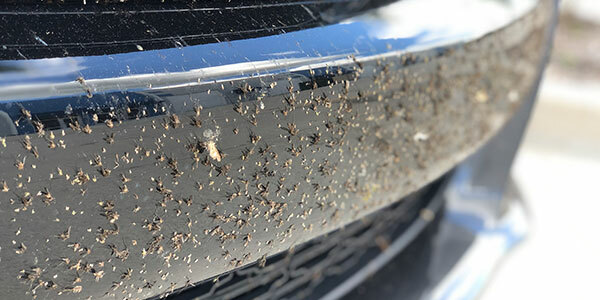 Let’s say your vehicle is covered in bugs, which is the case for most cars in Florida during love bug season. Instead of tackling each spot, it's best to wash your vehicle. As you’re soaping down the front of your vehicle, use the Safe Scrub to gently wash the entire area in a back and forth motion. The honeycomb texture gets under the bug remains and lifts them off the paint. To soften the Safe Scrub Bug Sponge, soak it in warm water for 3 minutes. The sponge will soften quite a bit, yet it’s still very effective. You can also use a 8 Inch Montana Original Boar’s Hair Brush. The feathered bristles are gentle yet effective at loosening stubborn grime. The 2-in-1 Wash Mitt is soft sheepskin on one side and bug-removing mesh on the other side. This one mitt is capable of luxurious washing and gentle scrubbing. A 2-in-1 Wash Mitt or a Boar's Hair Brush will help to gently remove bugs and grime. Yet another bug and tar removal option is detailing clay. 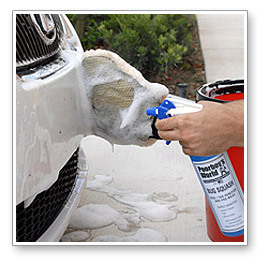 Clay was invented to remove paint overspray, but it’s proven very effective at removing tree sap, tar, and bugs. You’ll need a bar of detailing clay and a bottle of clay lubricant. Pinnacle Ultra Poly Clay is a fine grade clay designed for maintaining a slick finish. Wolfgang Elastic Poly Clay and McKee's 37 Universal Detailing Clay are both created to remove old, baked-on contaminants. 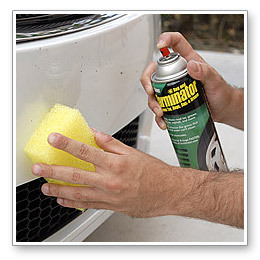 Spray the desired area with clay lubricant and then rub the clay bar back and forth. It will grab the surface at first. As it removes contaminants, the clay will glide more easily. 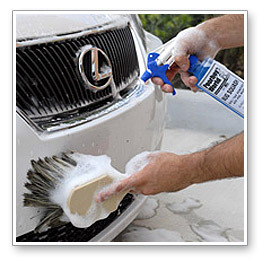 If you’re claying the whole vehicle or a large area, reshape the clay bar often to reveal clean clay. For more info on clay, see our Detailing Clay How-To. Detailing Clay can be used on auto glass, too. Use it exactly the same way as described above. As long as you use plenty of lubricant, detailing clay is perfectly safe on glass and metal. Wolfgang Elastic Poly Clay and Clay Lubricant safely remove bugs, tar, and sap. Always reapply wax after using detailing clay. Wax will make future cleaning easier. After you’ve removed the bugs, tar, and sap, protect the vehicle with a quality wax or paint sealant. Look for a slick one, like Wolfgang Deep Gloss Paint Sealant 3.0 or Pinnacle Signature Series II Wax. Insects will have a tough time sticking to a slippery bumper and, if they do manage to stick, their bond is often much weaker because there’re no surface tension. Therefore, the bugs are easier to remove. Windshield sealants, like Diamondite Shield, will have the same slick effect on the glass. Plus, a glass sealant increases the driver’s visibility by keeping the windshield cleaner.